Picking up after issue #3’s unsettling revelation of Sissy’s birth, Pretty Deadly #4 immediately kicks into gear as the rogues and not-quite-heroes of this haunting western tale unite to save Sissy. Writer Kelly Sue DeConnick delivers another air-tight script with this issue, brought to the page by artist Emily Rios and her beautiful sense of energy and space. Jordie Bellaire returns to round out this impressive creative team with her subtle color palettes, lending depth and softness to Rios’ otherworldly locales and delicate, fine-featured characters. Opening the issue with Bones Bunny and Butterfly, Johnny and Molly arrive at the river’s edge to pull Sissy from the water. In a scene that continues to play with the idea of animal forms, switching back and forth between Molly and Johnny’s respective namesakes, he explains (in part) the story behind Death’s binder. As they set off, we see Alice return to the underworld in her butterfly form, finding Death none too pleased with her. She promises to ally herself with Ginny to deliver Sissy, the Ascendant, to him, and he warns her not to disappoint him again as he restores her body. Alone again, Ginny’s mother, Fox’s wife and Death’s prisoner in the underworld, appeals to him for her release. Too in love to let her go, he promises he will free the both of them instead once he has Sissy. Washing up after the flood, Fox wakes to find Ginny waiting for him, Sarah at her side. Ginny prepares to kill Fox, still seeking to avenge her mother, but Fox won’t die until he tells her of Death’s plans for Sissy. Accepting his fate at the end of her sword, he appeals to her to protect Sissy from her father. This emotional confrontation comes to brutal blows but Ginny agrees to Fox’s final request, and in the ends spares his life for Sissy’s sake. As the issue closes, Johnny and Molly deliver Sissy to them. Fox and Sissy are reunited as the cast bands together to stop Death, with Alice appearing on the horizon for her final showdown with Ginny. 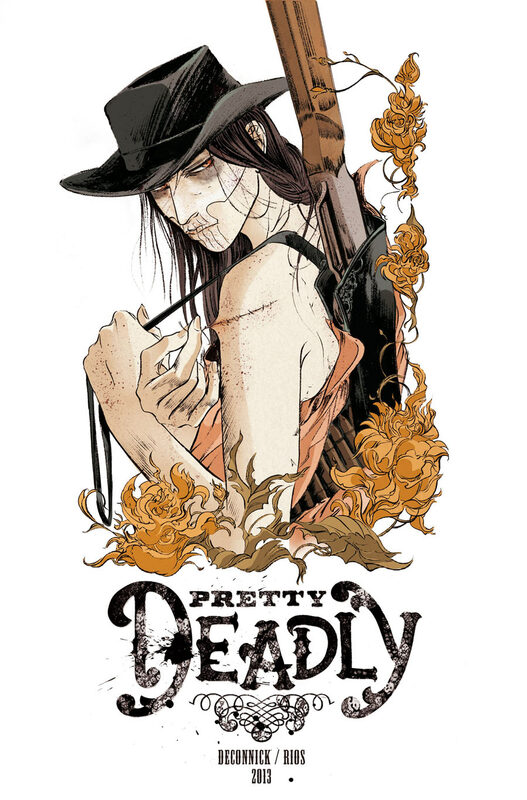 With another strong issue under its belt, Pretty Deadly continues to be my favorite book on the shelf. The slow development of the last three issues pays off here as we approach the conclusion of the first arc, with tensions coming to a head in dramatic confrontations and bittersweet reunions. If you’ve been a little lost with the structure of the last three issues, rest assured the pacing and structure of the book has settled into something a little more linear, even as DeConnick still maintains that initial sense of magic and sorrow throughout the series. With the mythology of Ginny, Sissy and Death firmly rooted in this ghostly western world, this book continues to gain forward momentum toward the inevitable confrontation with Death himself. It’s all headed for a showdown, but we have to wait and see how it all shakes out for this surprising cast of characters. After two issues of enduring mystery, Pretty Deadly #3 finally offers some of the genesis behind this supernatural western fable. The dynamic creative team of Kelly Sue DeConnick and Emily Rios continue to tease out their ethereal world of revenge and death, magic and symbolism with great success, shedding some much-needed light on Fox and Sissy. With little to go on in the first two issues, as readers we’ve been ambling along against the haunting backdrops of empty desert and fields populated by undead animal avatars, hoping for resolution. However, with great scripting from DeConnick and sumptuous artwork by Rios, brought to visceral fruition by Jordie Bellaire’s unearthly color palettes, readers get their first real tastes of the larger mythical world in this peculiar origin story. Once again we’re joined by Bones Bunny and Butterfly, who open the story to pose playful and foreshadowing questions about the ephemeral nature of life and death. From there we meet Molly, the crow who serves as Johnny Coyote’s moral compass, and warns him about the consequences of Sissy destroying his stolen binder. The rest of the issue unfolds in an intriguing exchange between Ginny and Sarah that further plays with the title’s use of animals of representatives of characters. This tense exchange adds to the growing mythology of the series, and alludes to true nature of the frictions between Ginny and the rest of the cast. It’s this confrontation that sets up the final act, culminating in Sissy’s true origin story and the truth of her quiet and tragic relationship with Fox. This is an unsettling and poignant sequence, and likely the most enduring of the series so far, tying up the questions surrounding Fox, Ginny and Sissy’s relations to one another. It beautifully utilizes the full breadth of the title’s unearthly visual language to establish Sissy’s place in the world and the larger mythology, closing on a flood that endangers the principle cast in a sorrowful cliffhanger. Despite a somewhat cautious opening section of the arc, the story really feels to be kicking into another gear in this issue. The crux of the issue, the development of the Fox and Sissy backstory, was wonderfully executed and a successful use of the book’s inherently eerie tone. This telling underscores the tragedy of their lives as traveling storytellers and keepers of Ginny’s tale, and creates some much-needed context for their relationship to continue to unfold. All of this comes from the strength of DeConnick’s tense and understated scripting, carried out by Rios’ innovative page design and dramatic panel composition. Every fluid stroke feels meaningful, whether in the delicate character details or the uncanny world in which they inhabit, maintaining a haunting aesthetic that makes this book visually unique and emotionally resonant. I find myself increasingly enjoying the use of animal symbolism in the book’s exploration of death. The introduction of the crow Molly as Johnny’s ethical guide is an interesting one, playing with the established reoccurring imagery of the rabbit, butterfly and the vulture. We are left to presume that Sissy’s symbol of the vulture is tied to her origin story, a bringer of death (in a very biblical sense) to balance Ginny’s role as an avenging spirit. Combined with Alice’s apparent death manifested in columns of butterflies and Ginny killing Bones Bunny in the first issue, these recurring visual allegories make for a more fascinating read. It accentuates the fairy tale-like quality of the world and invokes the aesthetic motifs of shamanistic lore, further grounding its unearthly ambiance. This is another successful installment of a gorgeous and complicated story. It’s not for everyone, but hopefully people will stick with it to see where it goes from here. Pretty Deadly takes the conventions of supernatural and spaghetti western storytelling and reinvigorates them in new and intriguing ways. Definitely one of my favorite books on the shelves right now. After a successful debut, Image Comics’ supernatural western Pretty Deadly returns for its second issue from writer Kelly Sue DeConnick and artist Emily Rios. Here we see the strange world of Deathface Ginny continue to unfold, seen through the eyes of Sissy as she and Fox ride to escape Big Alice. As their friends suffer at the hands of Alice and her men, Sissy must deal with the consequences of stealing from Johnny Coyote as Ginny arrives to balance the scales. Working together seamlessly, DeConnick and Rios further develop their spellbinding world of revenge and spirits through the strength of their collaborative efforts, making for a unique and engaging read. Bones Bunny and Butterfly return as our narrators, the eerie keepers of this tale, to open the issue to catch up with Johnny Coyote. The scoundrel is where we last left him, healing from his last run-in with Alice as the prostitute Lily tends to his wounds. During this sensuous encounter, Lily asks why Johnny let Sissy pickpocket the stolen binder, letting “her” (presumably Ginny, or another character yet to be introduced) loose to burn the world. Uncertain, Johnny admits he wasn’t sure why he let Sissy take it, but says he doesn’t care what happens. Meanwhile, Alice and her men arrive at Sarah’s doorstep, looking for Sissy and the binder. Far away, two sentries watch: The Night Maid, who sits by the campfire with her weapon at her side, and the Day Maid, a shriveled cloaked woman hiding in a cliff-side structure. At Sarah’s, Alice watches as men burn down the house, beating and torturing the family. Crying, Sarah’s son Cyrus begins to sing the song that Sissy taught him, calling on Deathface Ginny. Soon Ginny arrives with her gun and sword at the ready, quickly disposing of Alice’s men and rescuing the family. Turning her attentions to Alice, the two of them square off. Here we learn that Alice is a bounty hunter sent by Death to retrieve his wayward daughter, and that Ginny has no desire to return. After a lengthy struggle, Ginny takes Alice’s sword and decapitates her, and Alice’s body transforms into a column of butterflies. Riding away from the massacre at Sarah’s, Sissy worries about Sarah and Fox tells her not to look back. She goes on to tell Fox of her encounter with whom we assume to be Ginny, whether in a dream or a memory, where Ginny gave her a key. Asking Fox what these memories mean, he tells her to sleep, and that she’ll soon have the answers she’s looking for. Beautifully scripted with a strong command of language and imagery, DeConnick’s writing lives up to the standards she’s set for herself with this series. Without giving away any of its secrets, this issue skillfully builds upon the foundations of the first and contributes to the development of this title’s mythology. Who is Alice, and why is she represented by butterflies in death? If Ginny killed the now-skeletal Bunny in the first issue, are Butterfly and Bunny meant to represent Alice and Ginny? Questions like these leave the reader wondering. The introduction of new characters, such as the Day and Night Maids, and hinting at Sissy’s connection to Ginny, add to the growing sense of supernatural intrigue that envelops this book. This is a book that hinges on emotional subtly, and DeConnick’s natural talent for dialogue and character dynamics really flourishes here, serving as an essential counterpoint to the violence and bloodshed inherent to the story. However, this book is nothing without its artwork. Again Rios rises to the occasion through stunning visual language and an expert sense of storytelling. She crafts a dreamy landscape populated by butterflies and dead rabbits, and ghostly figures like Alice and Ginny. Her characters are delicately rendered, their barely-there forms crafted in wispy lines and a profound sense of dynamic motion. The sense of movement throughout this book is stellar, capturing the wind-swept desert, the arching of flames, the breeze blowing through fine strands of hair, all adding to the ethereal nature of this title. Overall, this is a solid and intriguing second issue to a compelling if somewhat offbeat series. 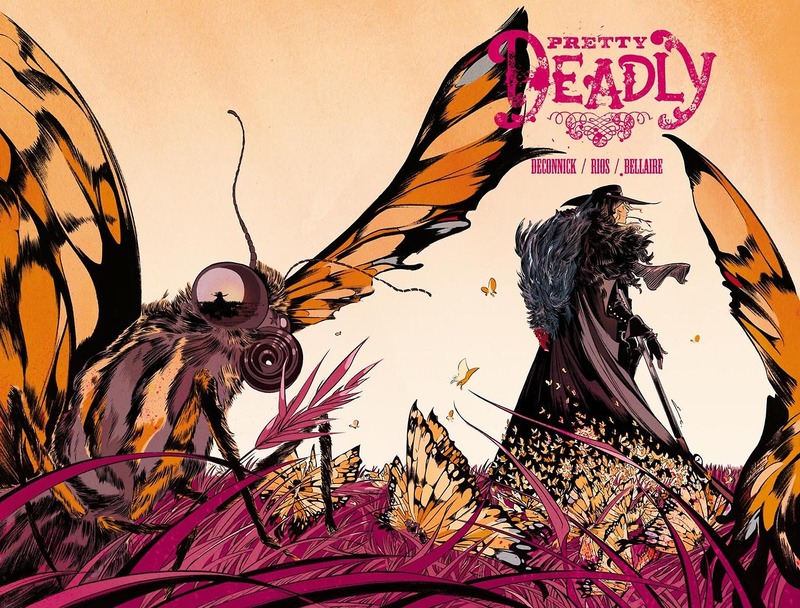 If you’re not sold on Pretty Deadly yet, hopefully this issue will change your mind. A unique read from cover to cover, this is a visually stunning western fairytale with great writing and artwork to back up its premise. 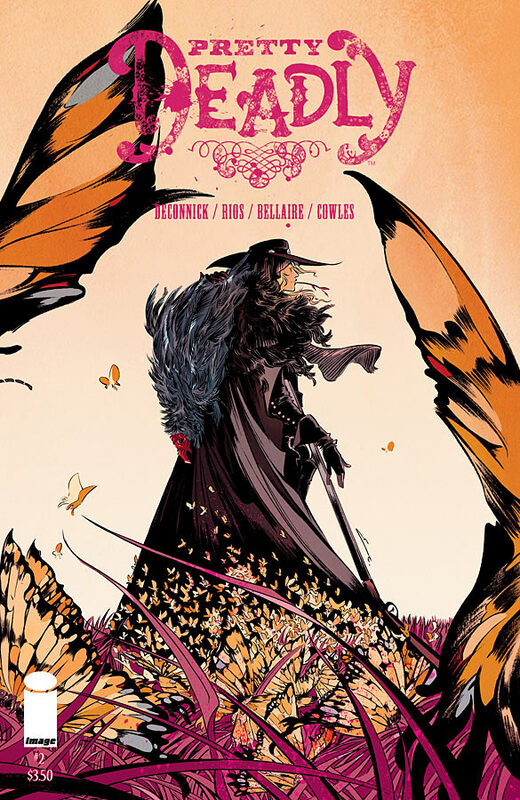 If you’re looking for something different – a little more mature but still steeped in mystery and magic, a grim fairy tale of a western – then look no further than Pretty Deadly #1. The much-anticipated passion project of writer Kelly Sue DeConnick and artist Emily Rios, a pair readers will remember from their collaboration on inaugural arc of Marvel Comics’ Captain Marvel, this title takes the well-traveled path of supernatural westerns and does something unique and engaging. Don’t look for any grizzled old cowboys, vampires or zombies populating the desert here, because you won’t find anything of the sort. This book is a peculiar mix of folklore and fable, western and mystery, centered on the legend of Deathface Ginny. While it plays within the familiar framework of these genres, it successfully lays down the foundations of the strange and alluring world where Death rides on the wind as an avenging spirit. Whatever you were expecting of this book, set that aside and simply enjoy what DeConnick and Rios have to offer. DeConnick opens the first issue on the interchange between a rabbit and a butterfly, as the rabbit meets its death at the hands of a little girl with a handgun. Serving as our narrators, the rabbit and the butterfly unfold the story of Sissy, a young girl in a vulture cloak. She and her adult companion, a seemingly blind and well-grizzled western archetype by the name of Fox, are traveling performers of sorts. Arriving in a quiet town, they set up stage to tell gathering townsfolk the tale of Deathface Ginny, the daughter of Death. After Sissy’s uncomfortable encounter with a man by the name of Johnny Coyote, she pick-pockets him for a piece of paper that puts her and Fox in the sights of Big Alice. On the run, Fox and Sissy have to rely on old friends as Big Alice and her men close in to collect whatever Johnny owed her, and Sissy clings to Ginny’s tale. Just what Big Alice wants with Sissy and Fox, and how this ties into the legend of Ginny, remains unclear. The issue doesn’t give the reader much context or history to grasp onto as the story begins, but DeConnick is very clever in developing these characters through intriguing scenes and well-scripted dialogue. The dynamics between her characters are tinged with subtle intimacies, despite the gruffness of their circumstances, which make their brief appearances feel very meaningful. Using the butterfly and rabbit as narrators was a fascinating choice as they hover in the peripheral of the story, introducing the fundamental mysteries of the opening issues without giving anything away yet. They create a deeper sense of mythology, really grounding the fairy tale-like quality of the plot. Also, be sure to read all the way to the back cover. DeConnick’s personal writing, as well as a one-page short story about Johnny Coyote, at the back of the issue help to provide a deeper emotional context to the premise and tease future development. 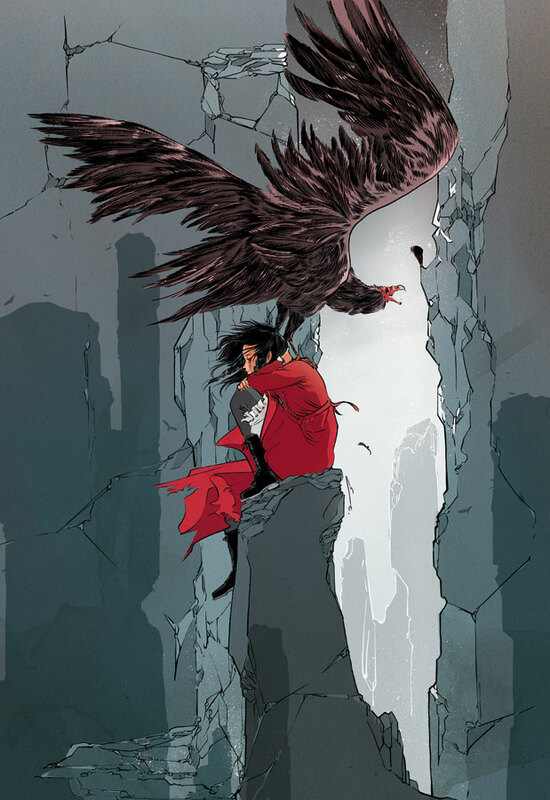 Rios’ artwork is a stunning complement to DeConnick’s scripting, carrying the book through engaging page design and the strength of her panel composition. The wispy, barely-there quality of her lines affects a distinct dreaminess to the settings and characters, and reinforces the supernatural spirit of their world. Her sense of scope and movement is really lovely and inviting, making the most of little details such as the wind blowing in Ginny’s hair or the feathers falling from Sissy’s cloak. She also does a phenomenal job of balancing this almost ethereal presentation with the realistic detail of the animals in the book, from the rabbit and butterfly to the vulture head of the cloak. It strikes an eerie chord and sets up a lot of attractive imagery throughout. Combined with Jordie Bellaire’s understated color palettes, this book is a visual treat. Lovely and strange, Pretty Deadly is an intriguing title with an aura of mystery and magic. How the legend of Deathface Ginny plays into Sissy’s life is unclear, but DeConnick and Rios still have a lot up their sleeves. This is a title to watch out for.